Here’s another interview for our series “Know your knife sharpener“. 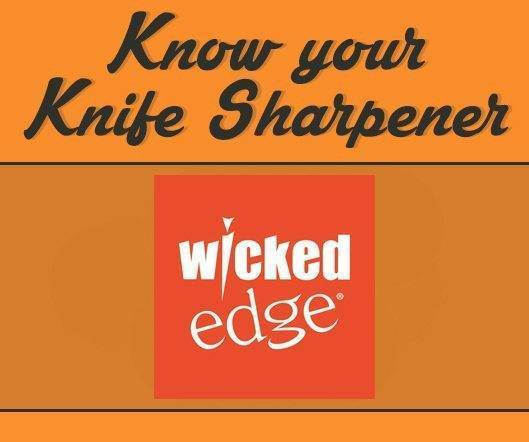 Today we’ve the pleasure to ask some questions to Clay Allison, the man behind Wicked Edge Sharpeners. 1. Hello Clay, can you tell us a bit more about yourself? I’m Clay Allison, born and raised around Santa Fe, NM. I’ve been married to my beautiful wife Kay for 19 years and I have two wonderful children, now both teenagers. I’ve had several careers in my life, each one transitioning into and preparing me for the next. I started out in the restaurant business, bussing tables, running food, then being taught to cook and eventually becoming the head chef of a couple small restaurants in Boston, MA. I later went back to the front of the house, first as a waiter, then as a manager and then general manager of some fine dining restaurants in Santa Fe. In the mid-90s, I left the restaurant business after getting married and started my first company which created and managed information kiosks for visitors to Santa Fe. Local galleries, restaurants, night clubs, movie theaters, etc… published their menus, exhibitions or other information with us and we in turn installed touchscreen kiosks around town, provided web access to the concierges at major hotels and the general public. The company also picked up a lot of business in web design and we created and managed websites for many of Santa Fe’s businesses. In 1997 I was given the opportunity to create an outfitting program on a large ranch in southern Colorado. Over the next 15 years the company built a prestigious hunting operation for elk and mule deer. Many notable hunters and industry professionals routinely hunted with us and our program was frequently featured on outdoor television shows. In 2007 I started developing the Wicked Edge sharpener to satisfy my need for a tool that would perform the way I needed it to. It took a while to get our machines onto the market and to get the word out, but eventually the sharpeners began to catch on and business started to take off. In 2012 I sold my outfitting company to focus entirely on Wicked Edge and, while I really miss my time in the woods and with my old crew, I couldn’t be happier. The things I care about the most are my family and my community, the outdoors and having a chance to spend some time in the woods. I love the crew at Wicked Edge and all the wonderful people I’ve had a chance to meet or correspond with along the way. Fall is my absolute favorite time of year with the smell of piñon smoke and roasting chiles on the wind, the cool air and warm sun and the sound of bugling elk. I live for soccer season and cheering for my kids on the sidelines with all the other parents and I love making a product that so many people enjoy and get excited about. 2. How did you start, and what are the reasons why you got involved in the knife sharpening business? I designed the Wicked Edge while I was in the process of making a how-to video for field dressing big game and kept being frustrated while touching up my knives. At that time, I could get my knives very sharp using the system I had, but touching them up always took too long and often required me to rebuild the entire bevel. I was pondering the problems with the system I had when the design for the Wicked Edge occurred to me. The next day I made a crude proof-of-concept in my garage with parts I rummaged up and was really excited when it actually worked the way I thought it would. From there, I was helped along the way by a lot of great people who offered advice, expertise and encouragement. Without them, there would be no Wicked Edge. 3. What were the biggest struggles when you started? The biggest struggles were taking the design into mass production and finding a manufacturing partner that wanted to work with a tiny company. It’s one thing to design something to be made as a one-off in a machine shop and a completely different thing to think of an invention in terms of which parts should be cast, extruded, stamped etc… I was really new to all of it and initially it was almost overwhelming. The internet was a big help and I was lucky enough to find some excellent mentors. Once we were in production, it took a couple of years before people took our machine seriously. 4. What distinguishes you from other businesses in your category? We’re really focused on precision and repeatability. There are a lot of good sharpening devices on the market, ours is different because our primary focus is outstanding sharpness that is easily repeatable and takes excellent care of the knife. Convenience and speed are also important but take a second position to results. We are also completely dedicated to customer service and satisfaction. We’ll do anything we can to ensure our customers have the best experience and results possible. 5. What’s your business biggest challenge at the moment? Our biggest challenges right now are getting the word out about our product and keeping up with demand. 6. What’s the most popular product that you’re selling right now? The Generation 3 Pro sharpener is really popular right now. It takes the best of our previous models and adds some really neat features like a self-centering, cam-driven clamp and one-step angle setting. 7. Are you still improving your products? If yes, how? We are constantly improving our products, taking feedback from our customers and our own experience and incorporating that information into the next version. We’ve added more precision and convenience as well as making the entire process faster for the user. 8. 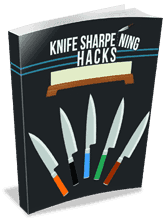 How should a newbie start sharpening knives? Beginners can start getting great edges right away with an angle guided system like ours. If they’re only sharpening for themselves and their friends, a system like ours is all they need. If they’re looking to get into the sharpening business, I’d recommend they also spend some time studying what goes into making a knife really sharp and learning about edge geometries and finishes and the requirements of all the different knife styles out there. They should read some of the excellent books on the market and ideally find someone to mentor them. An apprenticeship would be the best. 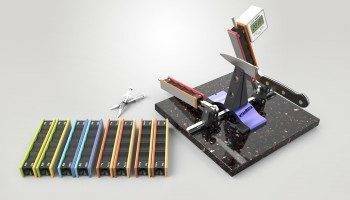 A newbie knife sharpener would do well to pick up one of the angle guided systems that allows the user to control the angle precisely, either the Wicked Edge, Edge Pro or KME. They should avoid powered equipment initially until they’re able to master the skills needed. 10. What do you think is the most common mistake beginner knife sharpeners make? When someone is first learning to sharpen, they often create pretty bevels that don’t actually reach to the apex of the edge, resulting in a knife that doesn’t reach its sharpness potential. Another common mistake is taking too much metal off the blade by not carefully monitoring what they are doing. I recommend using a marker to color in the bevel and a lighted magnifier to inspect the progress. A lot can be learned by frequently observing how the stones are removing the marker and making sure the marker is getting removed all the way to the very edge of the knife. Scratch patterns can be seen more easily helping a sharpener know when to switch to a different stone. 11. Tell us something people might be surprised to learn about you or your business. We’re really just a small company of very dedicated people who love what they do. Mostly we’re a collection of goofballs that want to be proud of what we do and try our best to deliver a great product with great service.